Two of Japan’s whaling ships have returned home from Antarctic with no catch onboard for the first time in nearly 30 years, local news reported. The news comes after a UN court ordered an halt to Japan’s annual “scientific” whale hunt. 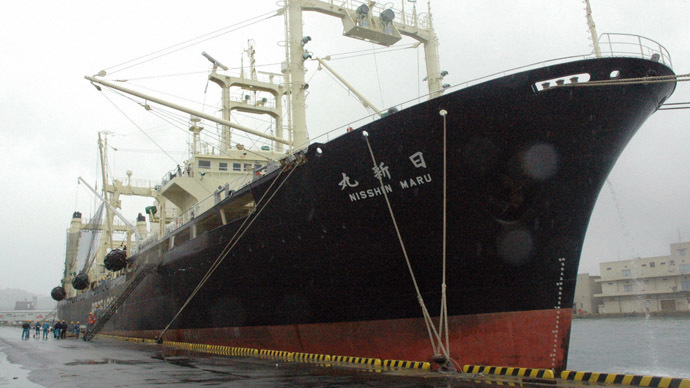 The 724-ton Yushinmaru and the 747-ton Daini (No 2) Yushinmaru returned to port in Shimonoseki, western Japan, which is considered to be one of the major whaling bases in the country, on Saturday. This is the first time the whale-hunting vessels have returned “empty-handed” since 1987, the year Japan started its annual scientific hunt of whales in the Antarctic, according to Asahi Shimbun newspaper. Researchers who took part in the expedition focused on observing marine mammals from aboard the ships. They conducted the survey and only took skin samples of the whales. "By collecting scientific data, we aim to resume commercial whaling," agriculture, forestry and fisheries minister Yoshimasa Hayashi told reporters in the port city as quoted by AFP. In 1986, a moratorium against commercial whaling came into force, under the International Whaling Commission (IWC), as whale populations plummeted toward collapse after decades of industrial-scale whaling. Since then, Tokyo has used a provision in the whaling convention that allows killing whales “for purposes of scientific research.” Japan began whaling for “scientific research” back in 1987, saying that most whale species were not endangered. In March 2014, the International Court of Justice ruled that Japan must stop whaling in Antarctica, saying that Tokyo had produced insufficient scientific data to justify the killing of whales for research. Tokyo canceled its Antarctic hunt, but carried out a smaller version of the hunt in the Northern Pacific in the summer. Japanese authorities then said that they planned to resume “research” whaling hunting by the end of 2015. In September, Japan submitted a new plan to the International Whaling Commission and its Scientific Committee, which set an annual target of 333 minke whales for future hunts instead of 900. Japanese whaling is a centuries-old tradition which dates back to the 12th century. During the 2014 Antarctic hunt 251 minke whales were killed and 103 the previous year, according to data from Japan's fisheries agency. In the Northwest Pacific, 132 whales were killed in 2013, and 92 off the Japanese coast. Meat from the whales usually ends up in food markets. Environmental organizations have repeatedly staged protests against whaling, which is also popular in Norway and Iceland.